The Reserve Bank of India (RBI) feels easing capital norms for banks in haste could be harmful for the economy. A comparison of the capital adequacy ratios of banks in both developed and emerging markets can give a clue about the RBI’s reasoning. The capital adequacy ratio denotes how much capital a bank has against its loans. Under Basel III norms, the minimum required is 10.5 per cent. Public sector banks in India control about 70 per cent of the market, thus their capital health is of more importance than private or foreign banks. 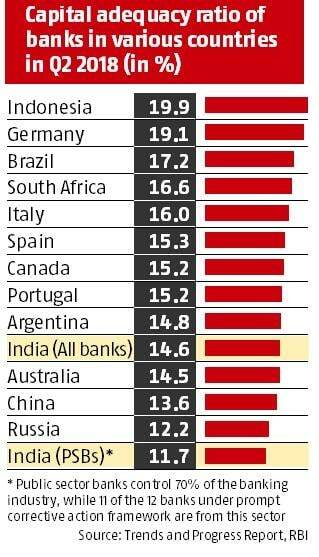 Compared to India, most other countries, except China, have private banks as key players in the banking segment. So, comparing India’s PSBs with other countries’ banking system may seem misleading at first, but not when seen in the larger context of PSBs’ market share. At the end of the June quarter, PSBs had a capital adequacy ratio of 11.7 per cent, as against 14.6 per cent of India’s banking system as a whole. The capital of PSBs, 11 of which are under the RBI’s PCA framework, clearly doesn’t match up with the global capital adequacies.